A morphological variation not causing functional impairment of the individual but that which can be visualized in internal or external structures or organs has been termed as an anatomical variation. Anatomical variations of teeth are not uncommon. Developmental disturbances of teeth size, shape, and structure are recognized entities. One such rare anatomical variation is supernumerary roots of teeth. These supernumerary roots, also called as additional roots, are common in molars and are rare in the anterior teeth. The mandibular canine is a single-rooted tooth, but on rare occasions may exhibit an additional root.,,,, This observation, where two roots were observed on the mandibular canines, provoked to take-up this study. Hence, it was aimed at determining the prevalence of additional roots on mandibular canines. Two hundred and two intraoral periapical radiographs (IOPARs) of adult patients in the age group of 18–70 years were analyzed retrospectively. Institution ethical committee clearance was obtained for the study. The radiographs had been made for the assessment of periodontal status, regressive alterations, caries and squeal, assessment of impaction, and for orthodontic purposes. All the IOPARs had been made at 70 kVp, 8 mA at 0.5–0.6 s exposure time with Endo Explor-X (Villa, India) IOPAR machine using bisecting angle technique and Snap-A-Ray film holders. The films were all subsequently processed in an automatic processor (Legitdent, China), dried and mounted for viewing. The inclusion criteria included IOPARS depicting the mandibular canine of either side, fairly well, with good visual characteristics. Exclusion criteria included partial images, radiographic artifacts, and IOPARs not depicting canines. All radiographs were viewed in a quiet room with ambient lighting using a magnifying glass and an LED view box, by a trained oral radiologist. Additional root was identified based on the presence of bifurcation of the root trunk. The additional root was identified and level of bifurcation was further noted. The prevalence and standard deviation were calculated using Microsoft Excel (Version 2007) for Windows 7. Two hundred and two IOPARs of patients in the age range of 18–70 years were screened for the presence of two roots in the permanent mandibular canines of either the right or left side. The mean age of the patients was 38.53 years. There were 63 male (31.2%) and 139 female (68.8%). 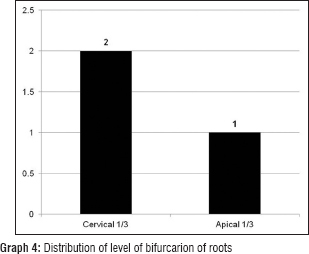 Three (n = 3) radiographs showed the presence of additional root, making the prevalence of 1.48%. The mean age of the patients depicting two roots was 37 years. Additional roots were identified in female patients only. The standard deviation and variance summarized in [Table 1]. Additional root was noted on the left side (100%) and bifurcation was noted at the level of cervical one-third in two cases (66.7%) and apical one-third in one case (33.3%). [Figure 1] and [Figure 2] depict the IOPARs with additional roots in the patients. 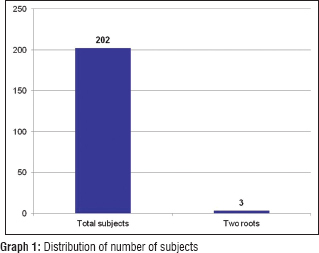 [Graph 1] represents the total number of patients and those exhibiting two roots. 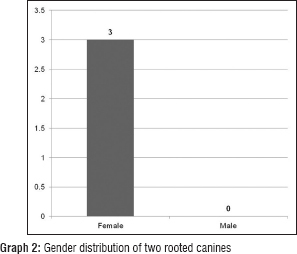 [Graph 2] shows the gender distribution of patients, [Graph 3] shows the side distribution, and [Graph 4] shows the level of bifurcation of roots. Although the etiology for the development of supernumerary roots are not known, some factors that have been attributed for the development of this entity. This includes external environmental influence during odontogenesis, higher penetrance of atavistic gene, racial, and genetic causes. 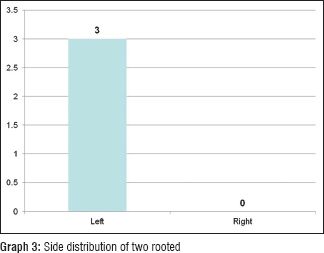 In the present research, supernumerary roots were noted in female patients only, all occurring on the left side. Interestingly, two out of three teeth were impacted. Hence, it can be hypothesized that impacted mandibular canines may show additional root. It has been estimated that the level of bifurcation in a two-rooted canine usually lies in the cervical-third region in about 43%–57% of the cases and in the middle-third region in about 40%.,,, In the present research, bifurcation was found in cervical third in two patients and apical third in one patient. It is also found that when bifurcation is found, the labial root is supposedly larger compared to the lingual root. Radiographically, it is said that when bifurcations are noted in the cervical- and middle-third regions, the labial and the lingual roots do not superimpose. If the second root is suspected to have superimposed, then the change of horizontal angulation of the X-ray beam by 15° may help visualize the additional root. Importance of knowledge about additional roots cannot be overemphasized. Identification of root canal morphology is extremely important for the success of endodontic treatment. 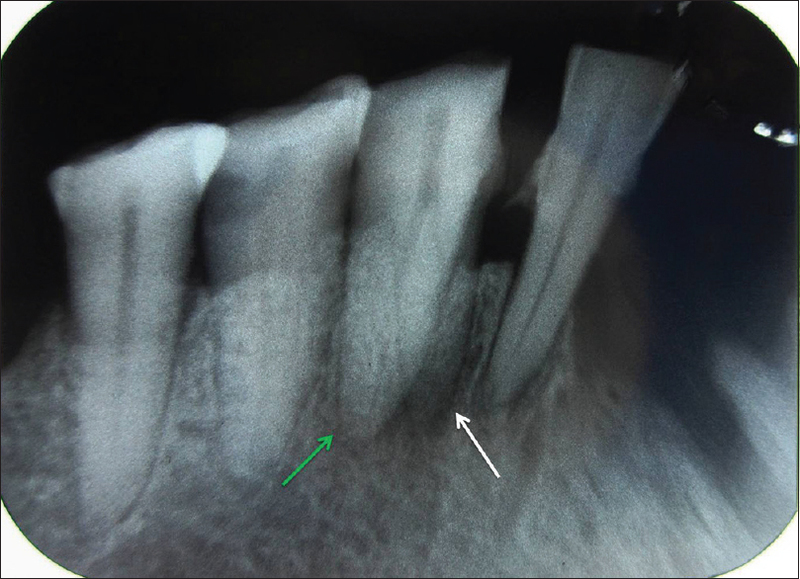 One common cause for failure of endodontic treatment is nonidentification of the additional roots or root canals., Hence, knowing the prevalence and characteristics of this rare anomaly may be a useful tool in clinical practice. Mandibular canines showing additional roots are very uncommon. Although the chance of finding an addition root in a mandibular canine is rare, one should be aware of the occurrence of such rare anomaly. Recognizing additional root plays a key role in endodontics, periodontics, and orthodontics. The present research has been successful in depicting the demographic features of this rare anomaly. Further research with larger sample size needs to be undertaken to know more about this anomaly, in depth. Da Silva RF, Do Praado MM, Botelho TL, Reges RV, Marinho DE. 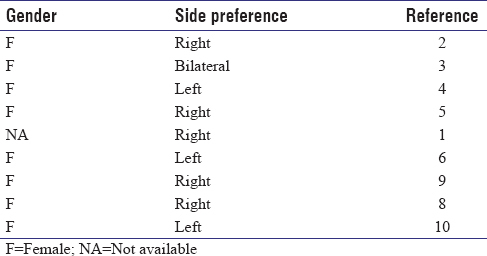 Anatomical variations in the permanent mandibular canine: Forensic importance. Rev Sul Bras Odontol 2012;9:468-73. Kaul R, Farooq R, Purra AR, Bhagat RK, Khatteb SU. Two rooted mandibular canine with severe dilacerations. Int J Clin Cases Investig 2012;4:75-9. Mithunjith K, Borthakur BJ. Endodontic management of two rooted mandibular canine. E J Dent 2013;3:339-42. Batra R, Kumar A, Bhardwaj K. Root canal treatment in mandibular canine with two roots: A case report. Int J Contemp Dent 2012;3:54-5. Reichart PA, Metah D. Three-rooted permanent mandibular first molars in the Thai. Community Dent Oral Epidemiol 1981;9:191-2. 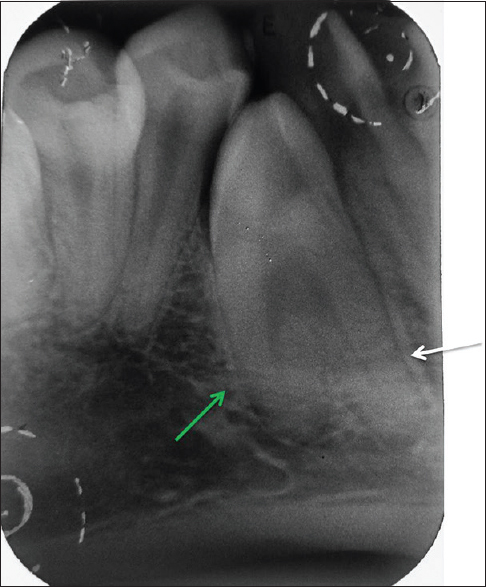 Bhardwaj A, Bhardwaj A. Mandibular canines with two roots and two canals – A case report. Int J Dent Clin 2011;3:77-8. Jadhav GR. Endodontic management of a two-rooted, three-canaled mandibular canine with a fractured instrument. J Conserv Dent 2014;17:192-5.